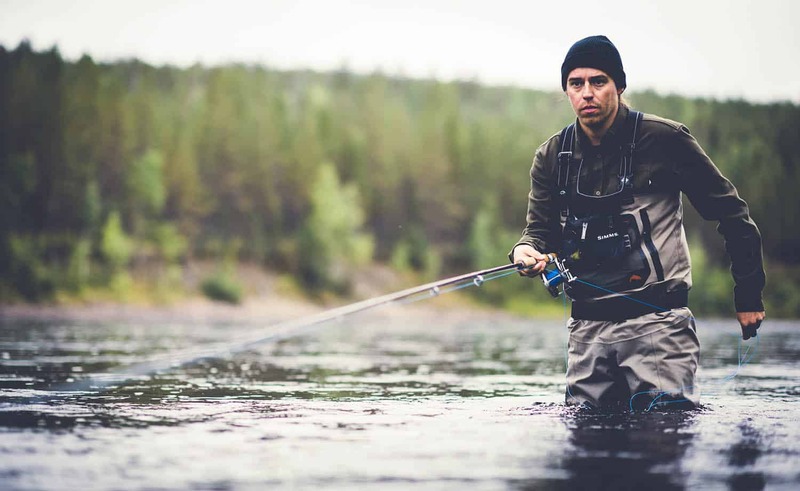 The Canadian brand Hooké started out of the urge to tell a story about fly fishing. Today it’s become a growing movement along rivers of the world. 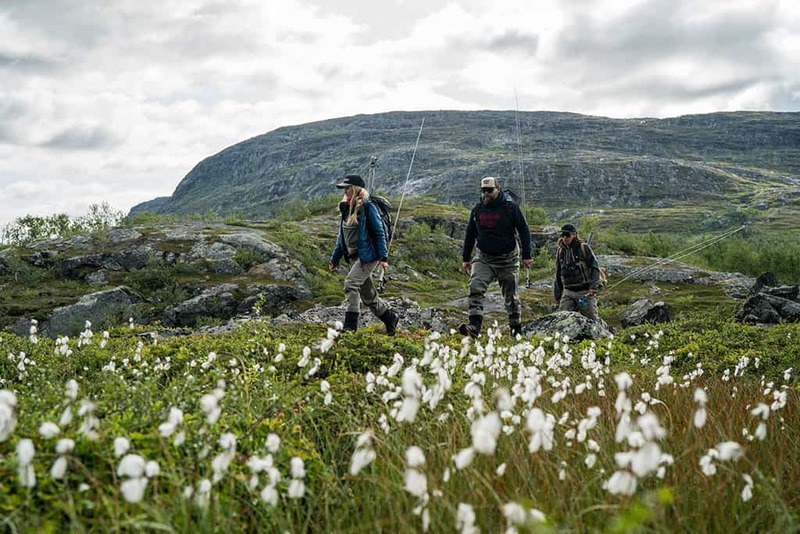 And in Swedish Lapland, the team seems perfectly rooted – spreading the vibes of fly fishing. We’re by the bank of the river Byske in Swedish Lapland. Me and Fred Campbell. 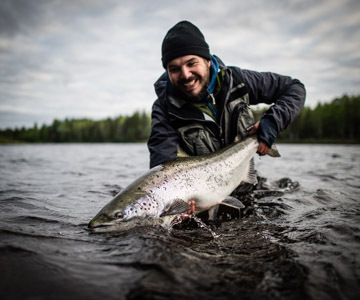 The river is renowned for big, Baltic salmons and badass fly fishing. 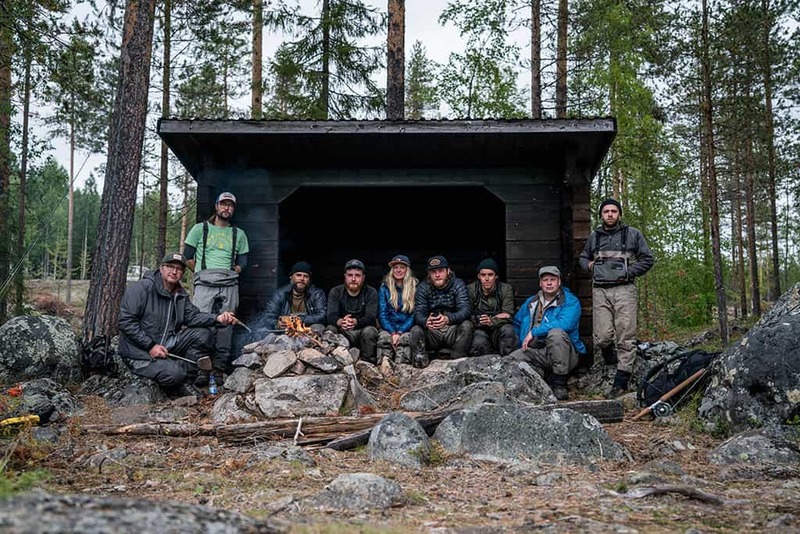 – If you want to stay true to the local tradition you go after the “Baltic’s” with 15-foot rods and a ridiculously amount of backing line, I tell Fred while taking a seat by the campfire, putting a coffee pot on the fire. The Baltic salmon is the same species as the Atlantic, but a key factor with the Baltic ones is the size. A 100-centimetre fish is obviously a good fish but nothing that will raise any eyebrows around here. 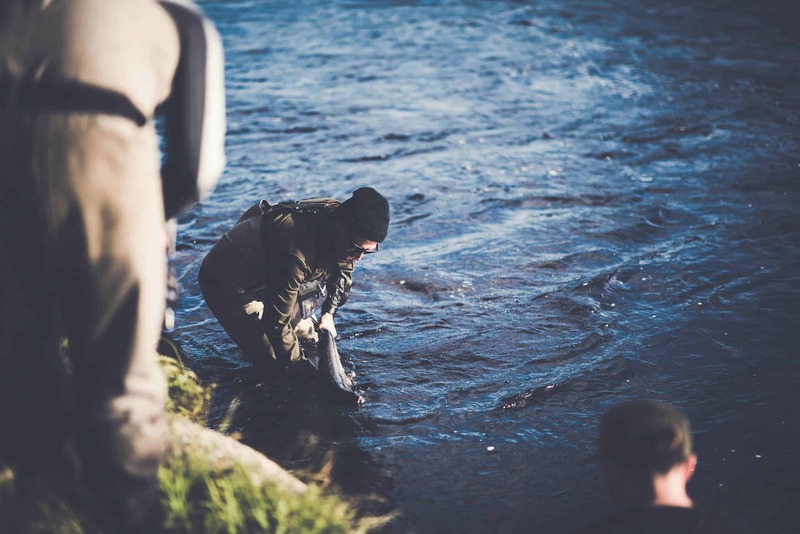 Fred Campell going for salmon in Byske river, Swedish Lapland. This is Hooké’s second visit to Swedish Lapland. The first time, in 2016, they hit it big time. Getting about 20 “Baltics” in front of the camera. – We’re fortunate enough to be in the right place at the right time, says Fred. The right place is the rivers of Torne, Lainio and Kalix in the north of the region. That something like a 100 000 salmon was running the rivers throughout the season. – So when we got the opportunity to come back here, it was a no brainer, says Fred as the coffee pot on the fire starts boiling. Fred says that Swedish Lapland has a lot in common with eastern Canada where he lives. Culture-wise as well as the scenery and the vast variation of fly fishing. 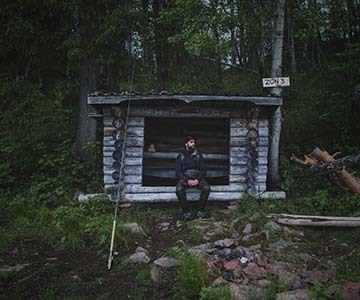 Hooké being in Swedish Lapland is all due to producing content. Mainly for the third season of their TV show running on the French channel UNiS. – Highs and lows. 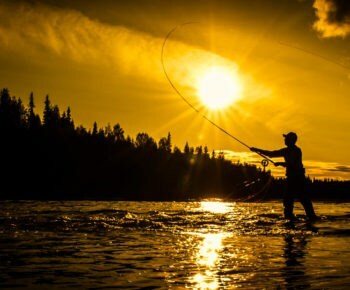 12 episodes from Canada and other fly-fishing destination around the world. It’s been a great success. This second time we went to Miekak for a grand slam, to Ammarnäs for big trouts and now to Byske for some autumn salmon. It’s just grand. – What is Hooké all about, I ask. Because it’s not just a TV show. Fred puts his hands on his head. Adjusting the beanie. – Ok, where should I start? It turns out Hooké is a lot of things. 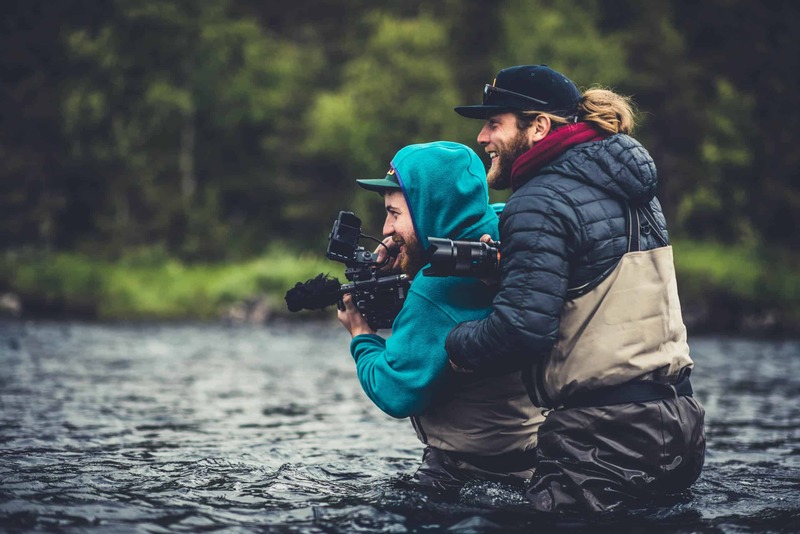 Sure, the tv production is a vital part of the project but Hooké also incorporates clothing, short series for the web, catalogues, fly fishing events and magazines. Not to mention a line of impressive social media feeds. – While on tour we do as much content as we can. Stills and video. That gives us the freedom to be creative and express our self, the way we want, later. The project is cleverly seamless and it’s not that easy to tell where one thing ends, and another begins. But it all is based on one thing – telling a story that connects. – Above all, says Fred, I think Hooke is a state of mind. Cherishing being outdoors, by a river with a fly rod. Being creative and spreading those fly-fishing vibes, so to speak. Fred returns a decent baltic salmon. The Hooke team is tight. Five to six people, or talents to be more precise, doing what they do best. Telling stories from the rural and the wild with a camera or storyboard in hand. – On travels, things can get pretty intense so it’s crucial to have none but the best people on board. A big part of Hooké’s success is the fact that they engage people. – People are smart. If you want attention, you got to be for real and stay relevant to your audience. There’s a fish rising in the tail of the pool. Fred seeks eye contact with Emilie Björkman, a local host for this year’s production, and nods in the direction of the fish. – Hooké is about fly fishing. But the fishing is more of a backdrop. It’s the people who gets us going. 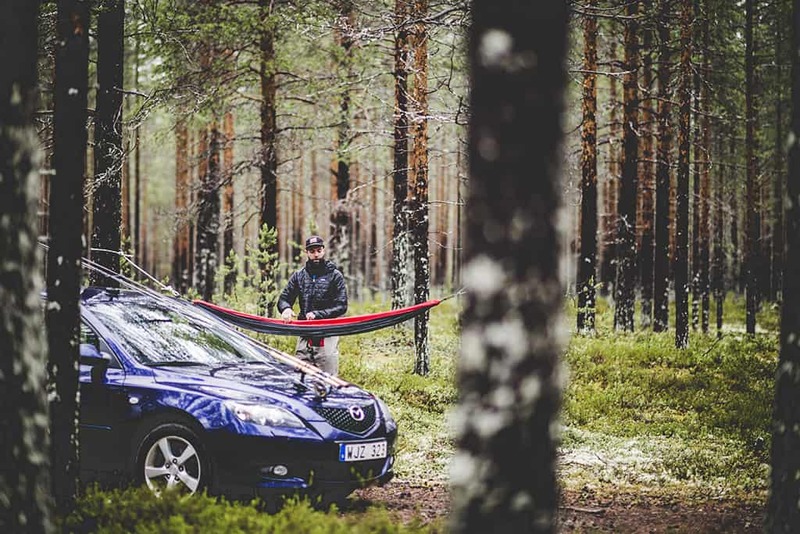 People who have dedicated their lives to the outdoors and being exceptional at what they do. Just take Emilie. It’s individuals like her who pushes us into doing the best content we can. So we want them to be proud of themselves when they view the final result. You know, they are lending us their life stories – That’s not to be taken easy upon. Same goes with last year’s film, “Laplanders” that was touring the world with the IF4. You know we dig into Lars and Calles life – and we want to do it with respect so they feel fine. I think we succeeded. Hooké is all about the people. Fred is in his 30s, growing up with the subcultures from the 80s characterizing everyday life. – I got into skateboarding, although fishing always was present, it was all about me and riding that board, he recalls. With skateboarding, video production got into the picture, and one thing led to another. In 1999 Fred started the creative studio Fokus production with a friend. – We grew quite fast, says Fred, and got some heavy client on board. Amongst others, Red Bull. – So we’ve done Red Bulls DJ events in some of the biggest cities in the world. It’s mental. Emilie, J-P and Fred where they belong. Photo: Alexis Pageau. You can of course follow Hooké on various digital plattforms. A good start is to visit there website hooke.ca. Last year Fred got named “entrepreneur of the year” by a Canadian business magazine. – People thought I was crazy getting into fly fishing, Fred smiles. But you know, you can’t help where your heart what’s to take you. It’s actually quite easy to get fond of something that’s not about just catching fish. Not even the biggest fish or the most. The team are for real. Doing what they love. Hanging out by a river with a fly rod, a storyboard and some cameras. Creating stories about other people we find real. Bringing success stories like “Laplanders” and the series “People we met” to a broader audience. – I think fly fishing, and the lifestyle that comes with it, is getting more appealing to people every day. 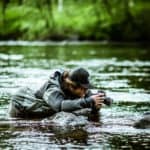 Fly fishing gives people a reason to reconnect to something fundamental, say Fred and reaches for his rod. You know, just being outside. By a river. In a forest. Being where we actually belong. Hooked. “Laplanders” (FILM) – Official Selection, IF4™ 2017 from HOOKÉ on Vimeo.